Comparing similar SUVs like the 2019 Honda Pilot and the 2019 Toyota Highlander is simple with our side-by-side breakdown of their standard and available features found below. You can see the differences in their drivetrain specs, interior dimensions, as well as their cabin comforts to help you decide which of these full-size SUVs is the right fit for you and your family. 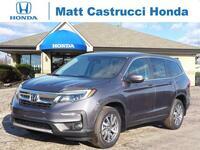 Keep reading to see all of the similarities and differences between the 2019 Honda Pilot and the 2019 Toyota Highlander. As you can see from the graph above the standard engine of the 2019 Honda Pilot outperforms the standard engine of the 2019 Toyota Highlander in almost every way. The 2019 Highlander does offer an engine upgrade while the 2019 Pilot does not but the available engine of the Highlander is a 3.5L V6 that has very similar performance and efficiency specs to the standard engine of the 2019 Pilot. 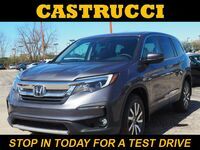 There is seating for seven or eight people inside the 2019 Honda Pilot and the 2019 Toyota depending on your choice of second row captain’s chairs or the bench seat. The 2019 Pilot provides 152.9 cubic feet of standard passenger volume and the 2019 Highlander only has 144.9 cubic feet of passenger space. You will find flex-folding rear seats in the 2019 Pilot and the 2019 Highlander but 2019 Honda Pilot provides more standard and maximum cargo space than the 2019 Toyota Highlander does. 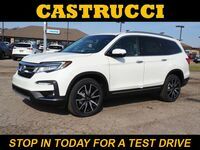 The standard touchscreen display of the 2019 Honda Pilot is only 5” while the 2019 Toyota Highlander has a 6.1” touchscreen but all but the base trim level of the 2019 Pilot and 2019 Highlander get equipped with an 8” touchscreen display. All but the base trim level of the 2019 Honda Pilot also get loaded with standard Apple CarPlay™ & Android Auto while the 2019 Toyota Highlander only gets iPod connectivity. 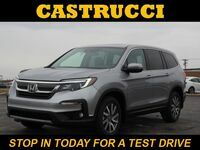 Thanks to its better standard drivetrain, more spacious interior, and better available interior features the 2019 Honda Pilot takes the win over the 2019 Toyota Highlander.